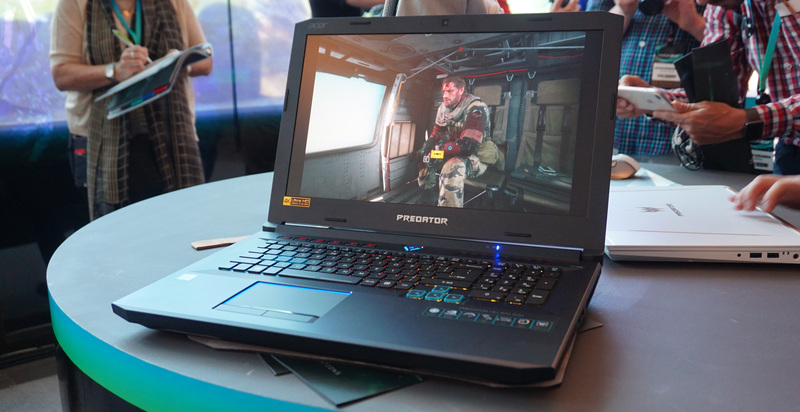 All right, that title might be a slight exaggeration, but in an age of lovely slim gaming laptops like the new Razer Blade, Acer’s freshly-announced Predator Helios 500 is still very much in the ‘absolute unit’ category of these sort-of-but-not-really portable gaming machines – so much so that Acer’s top man Jason Chen (pictured above, right) needed a little help showing it off onstage yesterday at his company’s global press conference. Weighing in at 4kg and measuring 428x298x38.7mm, this 17.3in laptop is positively monstrous compared to this year’s svelte Razer Blade, but take one look at its specs and you’ll understand why. With models going all the way up to a six-core Intel Core i9+ 8950HK (the + signifying the presence of Intel’s incredi-fast Optane Memory), a 4K IPS Nvidia G-Sync display and an Nvidia GeForce GTX 1070 graphics card, this is a laptop that means serious business. 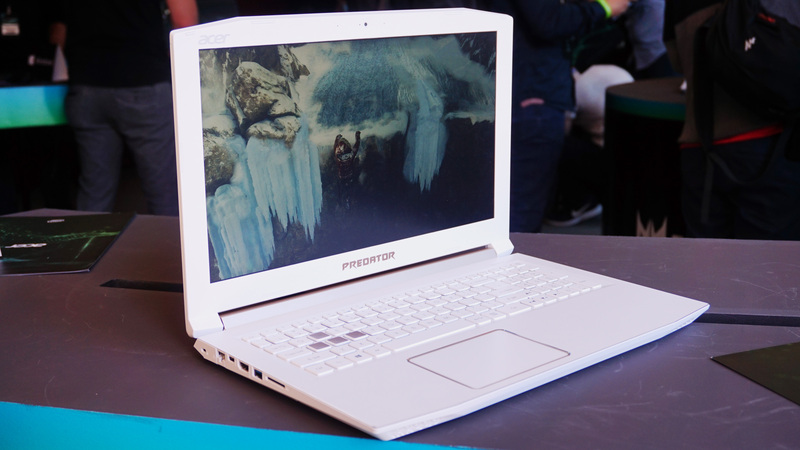 Let’s take a look.It will no doubt cost an absolute bomb when Acer eventually get round to launching it, but there will be cheaper Helios 500 models that start with a Core i5-8300H, as well as a Core i7-8750H version. For those that really want the best desktop replacement money can buy, however, then you’ll probably want to look at either the Core i9-8950HK version or the aforementioned + variety with Intel’s Optane Memory. As with Intel’s desktop processors, the K in those Core i9 chips means they can be overclocked, which goes a long way in explaining why the Helios 500 is so massive – it needs that space for all the extra cooling mechanisms Acer’s put in place to help prevent it from throttling under load. 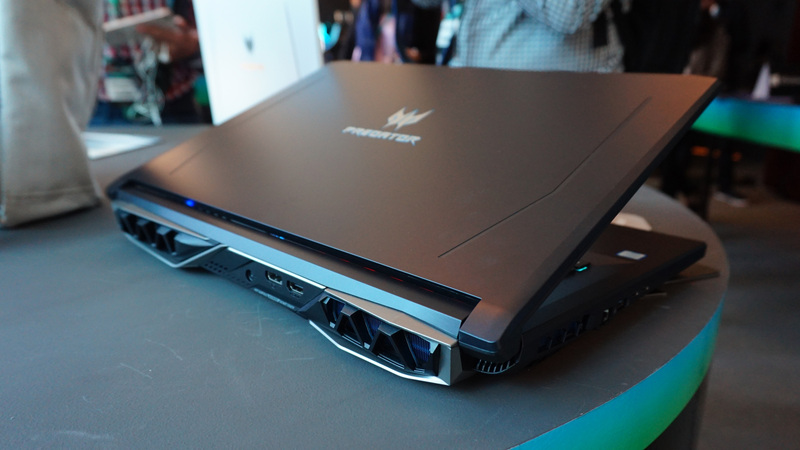 In this particular case, Acer have employed their dual Aeroblade 3D fan technology. There are 59 of these super thin, all-metal fans inside the Helios 500, so they should hopefully do a pretty decent job at keeping everything cool when the laptop’s being pushed to its limits. There will also be models with up to 16GB of RAM on offer, which can be upgraded to a ridiculous 64GB thanks to its four soDIMM modules, and you’ll also have the option of having a 144Hz Full HD IPS display with Nvidia G-Sync support if the 4K version doesn’t take your fancy. To be honest, when the only graphics option is Nvidia’s GTX 1070 card, I’d say it’s probably a better companion for high-frame rate 1080p gaming than it is proper 4K, especially if you’re after the best possible frame rates at the highest quality settings. The GTX 1070 can certainly do 4K – just – but you’ll likely have to compromise on graphical fidelity if you’re after a decent, playable experience. Still, at least you get plenty of choice when it comes to the Helios 500’s storage options. On the SSD side, there will be models with a standard 512GB SATA drive, or if you fancy something a bit fancier you’ll be able to choose from either a 512GB or 1TB NVMe SSD. There will also be HDD options up to 2TB as well. 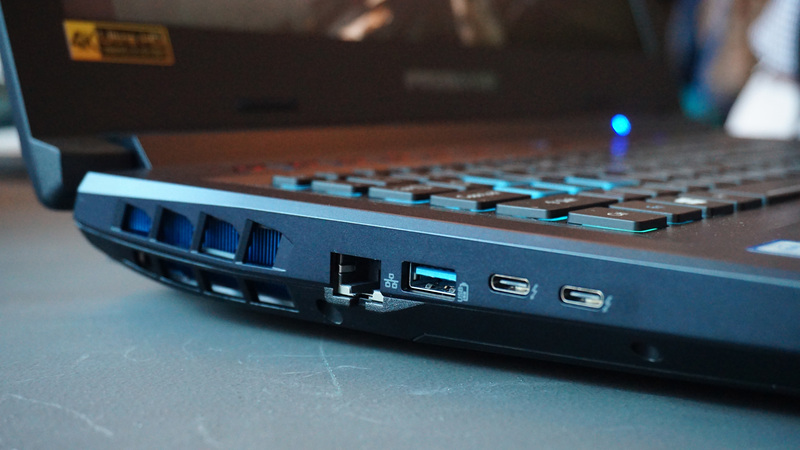 The keyboard, meanwhile, is your typical gaming laptop affair, with blue-ringed WASD and arrow keys complementing the turquoise LEDs surrounding the large touchpad. You also get five programmable macro keys up the top, and the P Predator key can change the colour of said macro keys so you can have everything just so. In fact, while the keyboard appeared to have full RGB lighting underneath when I looked at it from an angle, the actual effect is pretty non-existent. Personally, this is a good thing in my books, as it makes the laptop less distracting. However, for those who are really into their RGBs, this may come as something of a disappointment. 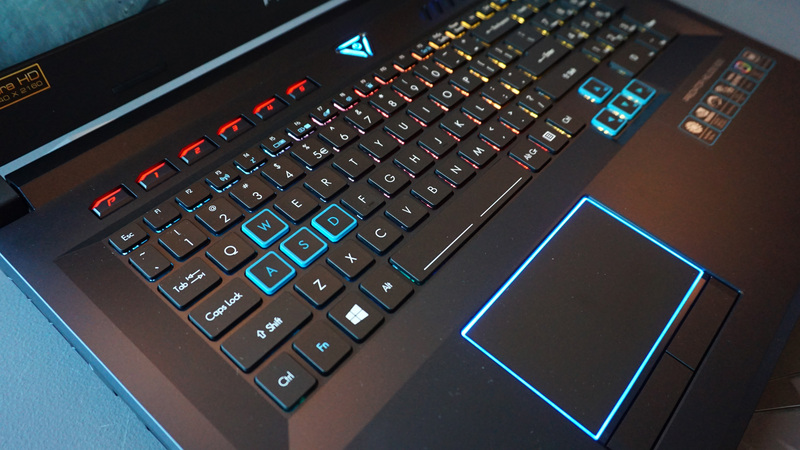 One thing we can all agree on, though, is that Acer’s choice of font for the Helios 500’s keyboard is a GOOD THING that isn’t the slightest bit sci-fi or attempting to ape the ‘try-hard gamer’ nonsense that’s sadly so common on literally every other gaming laptop in existence. You get a decent number of ports, too – which you’d hope would be the case given its huge footprint. You’ll find two USB Type-C ports on the left hand side next to one of three USB3 ports and an Ethernet port, along with full-sized HDMI and DisplayPort outputs on the back, and separate headphone and microphone jacks on the right next to the other two USB3 ports. 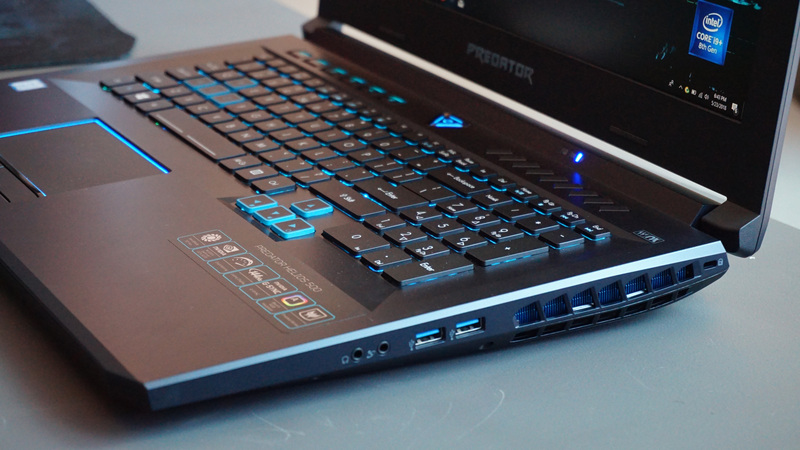 The Predator Helios 500 is, to all intents and purposes, still a giant lump of plastic, but as far as desktop replacements go, it looks like it could be a fairly reasonable option if owning a desktop isn’t practical for you. There’s no word yet on exactly how much it will cost, of course, but I should hopefully be able to put one through its paces soon to deliver my full and final verdict. In the mean time, let’s just breathe a sigh of relief that Acer didn’t also announce a special white and gold special edition of the Helios 500 (complete with matching accessories, I might add) like they did for its lesser sibling, the Helios 300, which I’ve included a picture of below for your viewing pleasure. Excuse me while I go and throw up in a bucket.